On a warm September morning, an unconscious man is found in a cage at the entrance to the offices of one of Germany’s biggest magazines. He’s soon identified as a manager of the company, and he’s been tortured. Three days later, another manager appears in a similar way. Chastity Riley and her new colleague Ivo Stepanovic are tasked with uncovering the truth behind the attacks, an investigation that goes far beyond the revenge they first suspect . . . to the dubious past shared by both victims. Traveling to the south of Germany, they step into the hothouse world of boarding schools, where secrets are currency, and monsters are bred . . . monsters who will stop at nothing to protect themselves. Hamburg author Simone Buchholz combines slick storytelling with substance in this slimline tale centred on a hard-living public prosecutor. 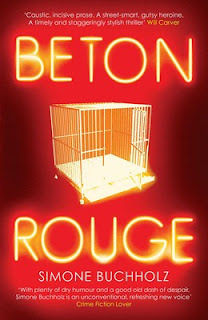 When I reviewed BETON ROUGE, my first taste of the Chastity Riley series, as part of my regular crime roundup for a print magazine in New Zealand, I compared the book to a straight shot of top-shelf liquor: "smooth yet fiery, packing a punch, with no extraneous ingredients watering things down." That encapsulates things quite well, I think. BETON ROUGE is slick and flows smoothly without feeling insubstantial. There's depth here, a weight to the story even if the book isn't weighty in size. There's also a dark energy to the fast and furious tale; it's a fascinating and appetising slice of German Noir. And noir it is: the main character is pretty hardbitten and there's a melancholy, even a sense of despair, running throughout, while at the same time there's dry humour and razor-sharp prose that gives BETON ROUGE an interesting energy and keeps things from becoming depressing. Buchholz has plenty of style in her storytelling. Along with translator Rachel Ward she writes in a way that's both lyrical and concise. Punchy but poetic, like a haiku more than a long saga. Chastity Riley is a fascinating heroine - not always likable, but always compelling. Like the writing itself, she is razor-sharp and peppered with dry humour. Both Riley and the reader get taken to some dark, even brutal, places in BETON ROUGE, but Buchholz and Ward never make it seem gratuitous. It's a little bit tricky to describe BETON ROUGE as it is quite unique and original, without feeling try-hard or having an obvious author hand forcing 'this is so different' onto the reader. It's just a really, really good crime novel that sparkles darkly, has a fascinating heroine, a great evocation of people and place, and a bit of a philosophical sense to it - while being more than the sum of its fine parts. I'll certainly be reading more of Simone Buchholz and Chastity Riley.